Voters guide: How much will Seattle’s education levy cost, and what exactly will it pay for? Here’s what you need to know about the city’s largest-ever education levy, and whether the expiring tax has made a difference in schools, before you send in your ballot. Seattle voters will soon decide whether doubling the city government’s investment in public education is worth a property-tax hike. The city’s existing levies to pay for certain K-12 programs and a subsidized preschool pilot both expire at the end of this year. 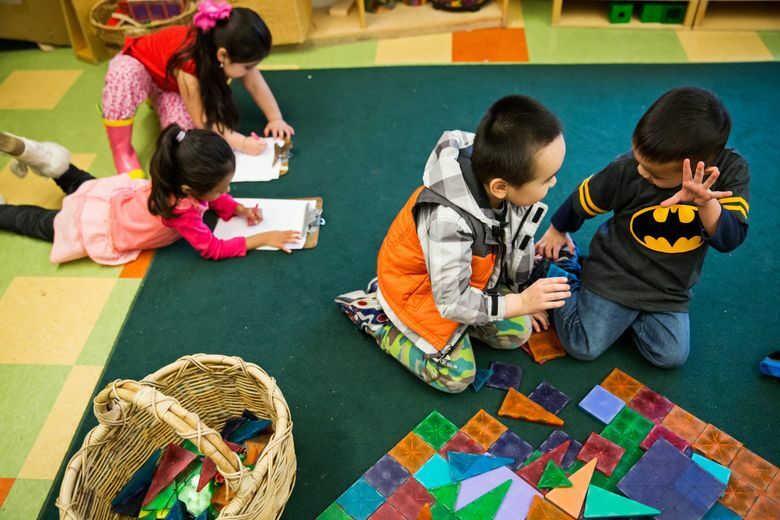 And after campaigning on a promise to make community college free for high-school graduates, Mayor Jenny Durkan has pitched the city’s largest-ever education levy to combine the K-12 and preschool programs with her proposed scholarships. On your ballot, this initiative will be called Seattle Proposition No. 1. Here’s what you need to know before you make this Election Day decision. If there are any more questions you want answered, ask us at edlab@seattletimes.com. How much would it cost? What tax hike can homeowners expect? If approved, the Families, Education, Preschool and Promise Levy would raise about $619.6 million over seven years and expire after 2025. The ballot language states that the city’s property-tax rate would be limited to 36.5 cents per $1,000 of assessed value, meaning the owner of a home with the median value of $665,000 would pay $242 next year to support the levy. The average yearly tax bill over the seven-year life of the new levy would be $248, up from $136 this year. Disabled veterans and low-income Seattleites could qualify for exemptions under state law. The city’s education levy has funded K-12 programs, family support workers in schools and school-based health clinics. The new proposal for the first time would include the city’s preschool program, which subsidizes tuition on a sliding scale, and college scholarships. The new levy also would provide $4.2 million to address the rising number of homeless students in Seattle. What programs would go away if it fails? “If the levy does not pass, our programs such as the … (preschool program) would be at severe risk of losing funding,” the email said. What do levy supporters point to as past successes of these programs? Overall, it’s a mixed bag. We’ll know more Monday, when the education department releases a third-year evaluation of the city’s preschool pilot. As for the Families and Education Levy, the department said it’s helped reduce the opportunity gaps at four high schools on measures like attendance and core-course performance. The department’s most recent annual report, however, for the 2016-17 school year, shows those high schools met just 2 of 8 targets for underserved students passing their core courses with C’s or better. The department also cited an analysis of the same groups of middle-school students over time. “Students were three times more likely to attain math proficiency by the end of the (8th grade) if they attended” a levy-funded middle school. But the department’s annual report shows fewer than half of those schools — 7 of 16 — met their academic targets in math. Only 4 in 7 met their targets in reading. Who supports — and opposes — this tax hike? Mayor Jenny Durkan proposed the levy and the City Council voted unanimously to send it to the ballot, with minor alterations. The politicians say it would help close the opportunity gap between kids from more- and less-privileged backgrounds. The city’s largest business and labor groups, including the Seattle Metropolitan Chamber of Commerce and the Martin Luther King County Labor Council, have endorsed the measure, as have five Democratic Party legislative-district organizations with territory in Seattle. Top contributors to the political campaign supporting the levy include Amazon, Mariners board member Chris Larson, hotel owner Howard S. Wright and the Service Employees International Union. No one has registered a political campaign opposing the levy. But the League of Women Voters has come out against the measure. And Melissa Westbrook, a local education activist and blogger, has argued against it. Does this have anything to do with charter schools in Seattle? As of last week, it’s unclear. The city spokesman on Wednesday said its attorney’s office still hasn’t answered two lingering questions about whether charter schools, which are publicly funded but privately run, could benefit from the levy: Can graduates from those schools also access the college scholarship program, and can charter schools compete with the traditional Seattle school district for K-12 grants from the levy? The Washington State Charter Schools Association, however, hasn’t ruled out that its members in Seattle will seek the levy money. Who would oversee how the city spends the levy revenues? Ultimate authority would rest with the mayor and City Council. But a standing oversight committee would include the mayor, a council member, the superintendent of Seattle Public Schools, a director on the Seattle School Board, the chancellor of Seattle Colleges and a dozen appointed members. The oversight committee would review a report of the levy’s impacts each school year and recommend changes. How does this proposal fit in with all the other tax hikes in Seattle? In 2018, the statewide property-tax rate rose to $2.70 per $1,000 of assessed value to pay for a new K-12 budget. Lawmakers earlier this year agreed to offer homeowners some relief, and approved a one-year cut to the statewide rate by 30 cents in 2019. The new state budget also capped the local property taxes that individual school districts can collect to pay for so-called enrichment activities, such as extracurricular programs or smaller class sizes. The Seattle school district currently taps its separate local levy to hire more school nurses and provide special services for students with disabilities. In February, the district will ask voters to renew that levy but plans to propose a higher tax rate than the state’s cap allows, just in case lawmakers offer some flexibility. Also in February, the district may ask voters to approve more than $1 billion in its capital levy for new school construction and renovations. Voters last approved that levy, with a price tag of nearly $700 million, in 2013. 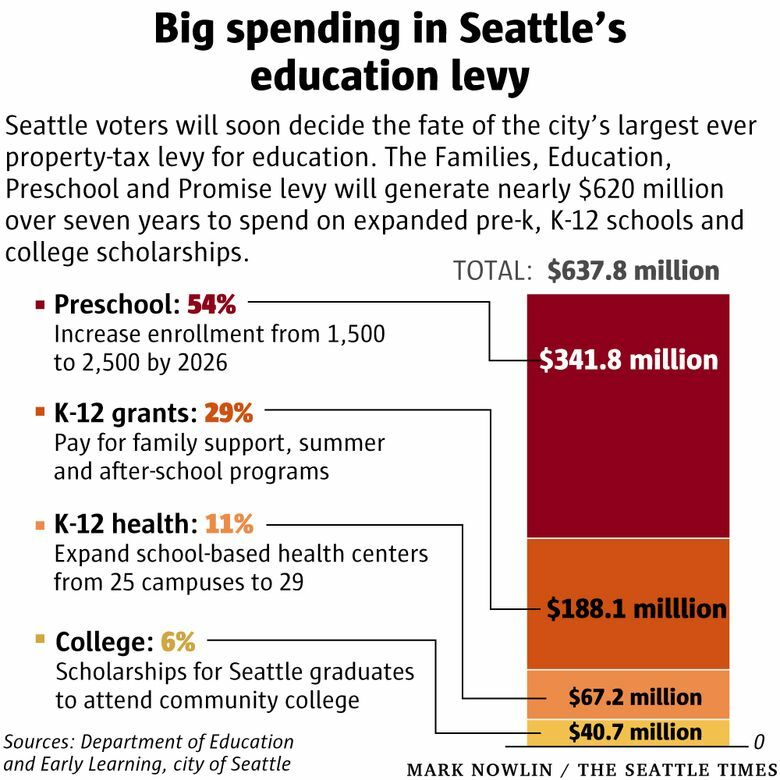 How does the fate of this levy affect the finances of Seattle Public Schools, if at all? The Seattle School Board’s budget for the 2017-18 school year topped $850 million, so the $20 million that Seattle Public Schools received from the city this year made up a little more than 2 percent. The district’s own operations levy, which voters consider every three years, typically represents about 15-20 percent of the overall budget. That reality has left district officials worried about voters’ willingness to support yet another tax for education on the ballot next year — after they’ve already voted on the city’s education levy. Seattle Times staff reporters Dahlia Bazzaz and Daniel Beekman contributed to this report.